A Certified Installer acts as an on-site DuPont Weatherization products installation expert, able to provide installation services to help seal the building envelope. DuPont™ Tyvek® Building Envelope Solutions Certified Installers receive classroom and on-site training on proper installation techniques and safety practices from a DuPont™ Tyvek® Specialist and must pass written and hands-on installation tests to become part of the network. 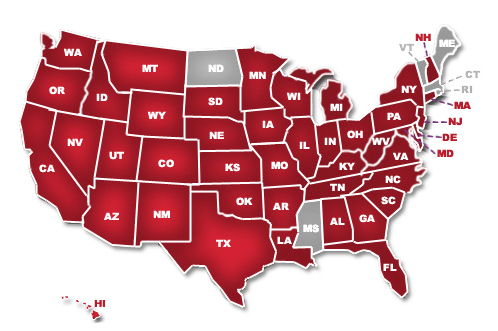 Click on any of the highlighted states in the map below to view the DuPont™ Tyvek® Building Envelope Solutions Certified Installers in that area. We continue to grow our network of highly qualified companies to our certified network, so check back for additional resources. Can't find what a certified installer in your area today, check the Helpful Links to find what you need.